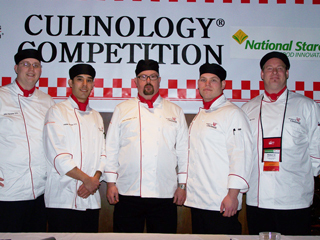 The third-annual Student Culinology® Competition at RCA’s 2009 conference exemplified the blending of culinary art and food science. An enthusiastic student team from University of Cincinnati took first-place honors, along with a $5,000 cash award and industry-wide recognition as rising stars in food-product development, at the third-annual Student Culinology® Competition, May/June 7, during the Research Chefs Association’s (RCA) 2009 conference at the Sheraton Dallas Hotel. The award was presented by Agnes Jones, principal culinologist at National Starch Food Innovation, at the 2009 RCA Annual Luncheon, where nearly 500 food-product-development professionals gather each year to celebrate industry achievements. The competition is designed to challenge and recognize the industry’s young talent in the Culinology field–the blending of culinary arts and food science. The winning team from UC was led by faculty advisor Christopher Keegan, CEC, senior research chef at Cargill Flavor Systems, and team leader Christian A. Serrato, CC. Team members included Robert Coltrane, CC, John Parsons, CC, and Andrew Scholle, CC. What do you do when one student takes charge, and the others stand around talking? I am a chef-educator at El Centro College, a regional two-year community college located in the South. As my culinary program “lives” within a larger college, we admit all students no matter their cooking ability. This means that on the first day in the kitchen I have 18 students in new uniforms waiting for instruction. Some have worked for years in professional kitchens, some have extensive experience in home kitchens, and some have never turned a stove on to boil water. Or, my big fat Greek dinner during the NRA Show in Chicago. I discovered Greek cuisine in Lincoln, Neb., at a small eatery called Papa John’s when I was studying at the University of Nebraska. No, this establishment had no relation to the franchised pizza parlor. It was located a few blocks away from campus and came complete with a large Greek family that could have been cast in the Hollywood movie, My Big Fat Greek Wedding. Each member of the entire family had tons of personality. The father and sons ran the kitchen while the mother and daughters tended to the tables and front of the house. The family always seemed to have fun working together in the restaurant. The food portions were as large as the owners’ personalities, perfect for a hungry college student. One of the reasons I enjoyed eating there was the ouzo, an anise-flavored liqueur. There were many nights when I consumed more than one shot of ouzo with my meal. I always enjoyed the atmosphere of the restaurant. Every meal was a celebration. Since then I have had many Greek meals, and it always invokes memories, feelings and smells of my time in the Cornhusker State and that little Greek eatery. Research shows no clear evidence that standardized tests are a credible measure of academic achievement or intellectual capacity. So why do we still use them? The problem of effective student evaluation has plagued educators for years. I’m not talking about a cursory glance, but meaningful assessment that provides us with a tangible reflection that genuine student learning was achieved. We probably all have a variety of evaluation mediums, but are we really assessing if our students have learned, or simply following course objectives by ensuring that students will “know”? Wine-tasting not only educates students or young professionals about wine, but also serves as a method to develop their sensory-evaluative abilities and hone precision in thinking and descriptive vocabulary. Wine is a valuable tool for revealing differences in their abilities and taste perceptions from others. They learn whether they are super-sensitive, sweet, tolerant or hyper-tolerant tasters, which will be of critical value in their careers. The advantage of using wine as a learning tool is that, unlike food, it can concentrate the mind on fewer tastes: sweetness, acidity and sometimes bitterness without the additional complex elements of salt or fat. The subtle differences between one wine and another helps to focus on narrow differences and thereby develops one into a more astute taster. It is essential to have comparative tastings so that students experience the differences between samples.